Howard Schultz- "Just because it hasn’t been done before doesn’t mean you shouldn’t try." I can’t give you any secret recipe for success, any foolproof plan for making it in the world of business. But my own experience suggests that it is possible to start from nothing and achieve even beyond your dreams. You have to have a great tolerance for pain! You have to work so hard and have so much enthusiasm for one thing that most other things in your life have to be sacrificed. I meant we didn’t want to concentrate on what others were doing and be reactive because then we would have been designing our stores against the competition instead of far the customers. The first step in building a business is to try to develop an enterprise customers will embrace and be excited about, to target a market and try to crack the code for success without worrying too much about what others are doing. Fear of failure drove me at first, but as I tackled each challenge, my anxiety was replaced by a growing sense of optimism. Once you overcome seemingly insurmountable obstacles, other hurdles become less daunting. Most people can achieve beyond their dreams if they insist upon it. I’d encourage everyone to dream big, lay your foundations well, absorb information like a sponge, and not be afraid to defy conventional wisdom. Just because it hasn’t been done before doesn’t mean you shouldn’t try. Dream more than others think practical. Expect more than others think possible. Risk more than others think safe. There is a direct link between how I grew up and how we tried to build Starbucks. I wanted to be in charge of my own destiny. It may be a weakness in me: I’m always wondering what I’ll do next. Enough is never enough. It wasn’t until I discovered Starbucks that I realized what it means when your work truly captures your heart and your imagination. You need to be willing to surround yourself with people more talented than you are in certain areas. You need a degree of fear of failure to keep you going. And, while everyone wants leaders who demonstrate courage, passion and boldness, you should not be afraid to show vulnerability now and then. What Starbucks has created around coffee is an extension of the front porch. If you look at the UK, the English pub is an extension of people’s homes but for a different beverage. Our stores have become a gathering and meeting place in addition to the coffee. Don’t be threatened by people smarter than you. Compromise anything but your core values. Seek to renew yourself even when you are hitting home runs. And everything matters. I believe life is a series of near misses. A lot of what we ascribe to luck is not luck at all. It’s seizing the day and accepting responsibility for your future. It’s seeing what other people don’t see and pursuing that vision. The hardest thing is to stay small while you get big, to figure out how to stay intimate with your customers and your people, even as your reach gets bigger. We want to be a respectful merchant so that we’re not trying to sell anything that would in any way dilute the experience. Great retailers recognize that they’re in the business of constantly surprising and delighting their customers. In many ways what we announced today is a milestone in building the business in China … But it mirrors what we did in the past 25 years in America in creating profitability and balancing that with a social conscience. We have a big opportunity in China … We think the number of stores here can rival the number in North America. Every single American needs to have access to health insurance — full-stop. I wanted to try and build the company that my father never got a chance to work for. We are exploring what else we can use in terms of other forms of entertainment, maybe literature? Literature is, I think, a natural extension. Success in the United States is not an entitlement in China. You have to go there and earn it, and earn it the right way. To get rich is glorious. We need to really invest ahead of the growth curve and get underneath the complexity of distributing products effectively and efficiently throughout the country. Europe has always represented a major strategic opportunity to achieve our goal of creating and building an enduring global brand. It’s a great American story and I think it shows the entrepreneurial spirit, that the entrepreneurial opportunity in America is alive and well. We have just begun to realize how large the global growth prospects are, and we anticipate many years of significant development in existing and new markets, … Ultimately we believe we can surpass 20,000 stores worldwide. We believe that there’s a very, very large opportunity still in front of us in North America. We think we’re on track to become one of the most recognizable brands in the world. We’re in 35 markets already. There are some new markets that we’re very interested in, such as Russia and Eastern Europe. India is another unique place to be in but it’s not going to happen tomorrow. But at the same time, we’re more focused on filling in the markets we’re already in. Also, you don’t want “yes men.” We look for people who aren’t afraid of creative conflict and debate over things that matter but who also respect the culture of the company. This is the most challenging issue – how to stay intimate when you get big. You have to make sure close relationships are maintained among employees and with customers, no matter how many other initiatives there are. You can’t let relationships get buried while you focus on sales, profits, competition, your investors and so forth. That’s why we spend so much money on communication and travel: to be sure we stay in touch. Be very careful not to allow the values of the company to be compromised by an ambition to grow. Every decision and opportunity has to be put into that context: What will it look like in the long term? Growth can be a seductive evil if it isn’t built on the right foundation. There are a lot of similarities between rearing a family, where the parents imprint values on their children, and starting a new business, where the founder sets the ground rules very early. If you do it right and maintain those values, growth will be managed so you don’t lose the soul of the company. That’s the primary role of the entrepreneur. I can’t do a better job than our CFO or our head of retailing – they have more expertise and experience. But I do believe I have an advantage in the history of building this business and in my connection with the people. This helps me make sure everyone remembers the guiding principles and the big picture and doesn’t get bogged down in the minutiae of decision-making. Open communication between departments and among all levels of the company is important so people don’t get too narrowly focused or forget how their decisions interact with those of others. China traditionally has been a tea-drinking country but we turned them into coffee drinkers. I feel a personal connection to each of our several hundred Starbucks partners and family members, as well as the community of neighbors they serve, who are victims of this disaster. Today, I am announcing a $1 million personal contribution from my family foundation to support the relief efforts. Starbucks represents something beyond a cup of coffee. The point of entry for the Starbucks experience has been much more a social experience (in China) rather than competition between coffee and tea. We’re not ever going to turn our backs on our partners. This partnership brings together two great, well-respected brands, which we believe benefits both Starbucks customers and The New York Times readers. London, a city where creativity and innovation have always flourished, provides a significant home for Starbucks and a significant gateway into Europe. We believe that we are still in the very early days of Starbucks growth cycle and that we can surpass 20,000 Starbucks stores worldwide. We are inspired by the tremendous response to the Starbucks brand domestically and internationally and could not be more pleased with the overall performance of the company. Providing our customers with innovative and unique ways to discover and acquire all genres of great music is another way we are enhancing the Starbucks Experience. Just as we have demonstrated with music, we believe that Starbucks can ultimately change the rules of the game for film marketing and distribution. We establish the value of buying a product at Starbucks by our uncompromising quality and by building a personal relationship with each customer. Starbucks is rekindling America’s love affair with coffee, bringing romance and fresh flavor back to the brew. Our core beverages, coupled with a strong holiday promotion, drove results in our retail stores, while solid growth in licensed locations led to the increase in our specialty business revenues. No market to date potentially has the opportunities for us that China ultimately will. Giving back to the community has always been a huge focus for Starbucks and each year we strive to create new ways to become more involved in the neighborhoods where we do business. With the launch of the California Giving Program, Starbucks has the opportunity to partner with some of the most amazing non-profit organizations in all of California that work to build stronger communities by nurturing kids and inspiring grownups. We are as passionate about our commitment to our communities as we are about achieving financial success. By creating this program with the China Soong Ching Ling Foundation, which has done so much good work for children, we will provide tools and teacher training that will help children in rural China build brighter futures. We can help customers discover entertainment. We believed very early on that people’s interaction with the Starbucks experience was going to determine the success of the brand. The culture and values of how we related to our customers, which is reflected in how the company relates to our [employees], would determine our success. And we thought the best way to have those kinds of universal values was to build around company-owned stores and then to provide stock options to every employee, to give them a financial and psychological stake in the company. We thought the best way to get to those values would be to have all the employees working for us. [As a result,] Starbucks has the lowest employee turnover of any food and beverage company. I always viewed franchising as a way to get access to capital, because you’re using other people’s money to grow, essentially. And we were dealing with a premium product—something that can be hard to learn, that you have to explain to the customer, that requires an educated staff. 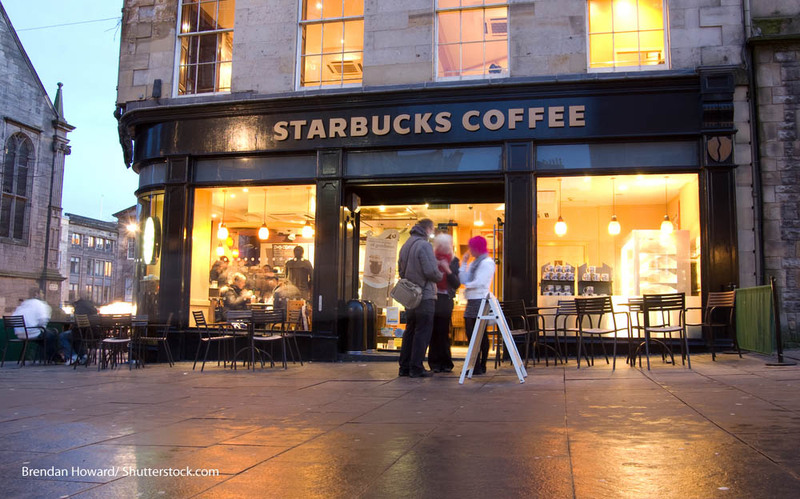 It would have been hard to provide the level of sensitivity to customers and knowledge of the product needed to create those Starbucks values if we franchised. You can be just as entrepreneurial and experimental in a company-owned model. There are a lot of advantages to the company-owned model. You can create universal company values. You can read the marketplace and turn on a dime. As a company-owned business, we can do that. But if you’re a franchised company, it’s hard to make quick adjustments because there’s an extra level of people in the business [the franchisees] that you have to basically pass all the decisions through. And that can make these kinds of transitions harder. Being company-owned also allows you to find significant new revenue sources without having to worry whether they might compete with your franchisees’ businesses. We’ve created a major new revenue source recently by selling bags of Starbucks coffee, bottled Starbucks coffee drinks and Starbucks ice cream in supermarkets. But imagine if we were a franchise. It would be difficult to sell products in supermarkets because most franchisees probably would see that as competition and not like it. In a franchise situation, there are a lot of prohibitions on territoriality and exclusivity. We don’t have those problems, so we can open up many stores in an area quickly and even sometimes cannibalize our own business. In a company-owned business, you might not have the kind of local owners that you have in franchising, but as a manager, you have to come up with ways to encourage entrepreneurship. We do that with [stock] options, which works. Frappuccino was invented by one of our store managers. We’ve gotten big, but we’ve stayed small-keeping our intimacy with our staff and customers. The word saturation is not even in our vocabulary. I would say strongly, the success of Starbucks demonstrates the fact we have built an emotional connection with our customers. I think we have a competitive advantage over classic brands in that every day we get to touch and interact with our customers directly. Our product is not sitting on a supermarket shelf like a can of Coca-Cola. Our people have done a wonderful job of knowing your drink, your name, your kids’ names and what you do for a living. We have no patent on anything we do and anything we do can be copied by anyone else. But you can’t copy the heart and the soul and the conscience of the company. It’s a great example for other young people about execution and doing things the right way. You don’t have to have a cure for cancer, this is just a basic business. We kept looking at it and looking at it, and finally we said, let’s take the other side of the street. My board members thought I was out of my mind. The original store experienced 10 to 15 percent sales dilution for the first year both were in operation, but within 18 months, the two had developed different customer profiles and were in positive sales territory. We’ve repeated that strategy countless times. The way we have built our company by including the success of the company with everyone in it and not leaving our people behind is a great example of building a business the right way. 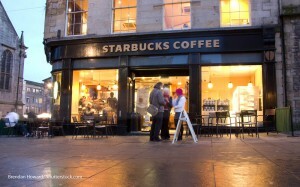 We look at the brand not as a piece of advertising but everything we do communicates who Starbucks is. The place, the physical environment really has become an extension of the brand and it’s very important to the success of the company. The taste of our coffee has really created such a quality experience that we’ve been able to convince people over the last 20 years that it’s still a very good value even though it’s more expensive than traditional coffee you can find at a diner. The majority of our customers make their own proprietary beverage, a double tall latte, vanilla latte, frappuccino. We’ve made it fun. It’s still so early on for us. We’re in the embryonic stages of the growth of the company. Our dream is to continue to grow the company and become one of the most recognized and respected brands in the world. Coffee will always be the core of what we do. So many companies have made mistakes by not sticking to their knitting and they start believing their own press. That’s not going to be us. Our mission statement about treating people with respect and dignity is not just words but a creed we live by every day. You can’t expect your employees to exceed the expectations of your customers if you don’t exceed the employees’ expectations of management. That’s the contract. We give our employees – we call them partners – 24 hours of training, which includes not just the nuts and bolts of what we do but also [explains] how we treat our people. Many. of them come from companies where they were not treated well, and they are understandably very cynical. They don’t trust management. We rebuild that trust by providing an environment that shows them we value their input, where they won’t be reprimanded for constructive criticism, and where they are rewarded for initiative. Some of our best ideas have percolated up from the bottom. It’s ironic that retailers and restaurants live or die on customer service, yet their employees have some of the lowest pay and worst benefits of any industry. That’s one reason so many retail experiences are mediocre for the public. We pay our partners well at every level, compared to similar positions at other companies. In 1988, we did something no one else had done, which was to offer our part-time employees comprehensive health care; in 1991, we offered all employees stock options. These benefits have paid for themselves in increased productivity and commitment to the business on the part of our partners. We wanted to be careful about hurting morale, but we learned how to combine respect with open communication. At first, we were also concerned about whether we should share information about some of the problems management was facing. That changed a few years ago when there was a severe frost in Brazil that damaged the coffee crop. I got up and made a speech that was very uncharacteristic of me, telling everyone what we knew. Not everyone appreciated it; some wanted a leader with unbridled confidence. But there are times when it’s important to tell the whole truth. He remembers his father, who struggled mightily at low-paying jobs with little to show for it when he died. He was beaten down, he wasn’t respected. He had no health insurance, and he had no workers’ compensation when he got hurt on the job…I wanted to build the kind of company that my father never got a chance to work for, in which people were respected. We are going to shock people in terms of what Starbucks is going to be. This is a time when there is a shortage of labor and few people want to work behind a retail counter, so hiring is a real challenge. We want passion for our business – workers who can interpret and execute our mission, who want to build a career, not just take a temporary job. Hiring people is an art, not a science, and resumes can’t tell you whether someone will fit into a company’s culture. When you realize you’ve made a mistake, you need to cut your losses and move on. We’ve demonstrated that it provides a competitive advantage, and that’s true for any company of any size. We’ve tried to build a company that is diverse in gender, race and age. The worst thing you can do is surround yourself with people like you, which is the comfortable thing to do. The ability to recognize limitations in yourself is what determines whether you have a great idea that can become a great business. You can’t keep your finger on the pulse of all the issues you’ll face; no one person can do everything. Entrepreneurs are bold thinkers, but they’re usually not detail-oriented. You need the self-esteem to hire people who are smarter than you and give them the autonomy to manage their own areas. Surround yourself with great people and get out of the way; don’t try to micromanage things as you did early on. Management has to leave its ego at the door as the company grows. You have to hire people who have experience at the level that is your goal. And you have to get these people and put disciplines in place well before you need them, because you can’t play catch-up when you’re growing very fast. One reason we’ve been able to exert an unusual amount of control over our products is because we never franchised. When we began to license and form strategic partnerships and joint ventures, we spent a lot of time with the other [companies'] management to see how they operate in good times and bad, and whether we shared a similar view of the world. You are judged by the company you keep. There were a lot of unexpected bumps in the road, and sometimes we had to change our original concept of how to do things, but we always adhered to our central values and learned a lot from these bigger firms. Customers don’t always know what they want. The decline in coffee-drinking was due to the fact that most of the coffee people bought was stale and they weren’t enjoying it. Once they tasted ours and experienced what we call “the third place” – a gathering place between home and work where they were treated with respect – they found we were filling a need they didn’t know they had. Customers today are more open than ever to new ideas. It’s an incredible time to start a new business or introduce a new product because people are eager to try new things. We’re very fortunate to have customers who are passionate enough about what we do that they let us know very quickly when they’re dissatisfied. We have customer comment cards in the store, we get thousands of phone calls to our customer relations department each year, and we train our partners to give feedback about what they hear. We still don’t do much conventional advertising because we find there is just too much competition for consumers’ attention in TV, radio and print media. This is especially true for a small enterprise. My advice would be to pick one or two charities or events that reach the community you serve, where you can make a difference that will be appreciated. This will inspire people inside and outside the company and reinforce the company’s values and image. The main thing is to get experts involved at the start because there are all kinds of hidden costs. Don’t try to figure it out on your own. If it’s done well, mail order can be an effective way to build a brand name. We use it to seed new markets: We look at where our mail order customers are when we’re deciding where to open stores next. I was turned down by 217 of the 242 investors I initially talked to. You have to have a tremendous belief in what you’re doing and just persevere. The three venture capital firms we ended up with in 1989 are still on the board today and have been an invaluable resource. You have to build a board where there are shared values and trust so you aren’t always at odds. I encourage board members to be honest with me, and I give them assignments that enhance their contributions. As for going public, you get immediate access to capital and liquidity, but you have to be ready for intense public scrutiny and financial discipline. Management has to be aware that it’s better to underpromise and overdeliver each quarter because Wall Street can be shortsighted and unforgiving. I’ve gotten much better about this, and I’m very disciplined about the things I won’t do, like travel on weekends. I try to be home for dinner with my family most nights. I’ve learned a balanced personal life makes for a more productive business life. Feeling great about your family life adds value to the company. Great companies recognize who they are and who they are not. But they must have the courage to examine transformational opportunities. We are the most frequented retailer in the world. With hundreds of thousands of songs digitally filed and stored, these Hear Music coffeehouses combined with our existing locations can become the largest music store in any city that we have a Starbucks in. And because of the traffic, the frequency, and the trust that our customers have in the experience and the brand, we believe strongly that we can transform the retail record. We have the potential to become the most recognizable and respected brand in the world. We’ve known for a long time now that Starbucks is more than just a wonderful cup of coffee. It’s the experience. I’ve heard that some coaches face a curious dilemma. The world-class athletes on their teams–the players with the best skills and experience–sometimes falter when it comes to crunch time. Occasionally, though, there’s a player on the team, a blue-collar guy whose skills and training are not quite world-class. Yet at crunch time, he’s the one the coach sends out to the field. He’s so driven and so hungry to win that he can outperform the top athletes when it really matters.